These notes have been created from what little material is still available from the era, my own recollections - now somewhat lacking, items related to successive owners of KYOI, and entities not directly associated with KYOI. I have included my own comments, opinions and memories of how I made an extremely minuscule impact on the unfolding events. Whilst every care has been taken, I am sure there are many errors, omissions and some hyperbole in this document. Much work is still to be done expanding this site. I gratefully acknowledge the assistance offered from many sources worldwide. I would be grateful for comments from anyone who can expand on, or correct, this document. A full bibliography and citation listing is provided at the conclusion. Company names, trademarks and product names are used merely in describing their historical association with KYOI. No commercial gain or infringement of ownership rights is intended in their use. The idea for a pop / rock station on Shortwave first appeared in early 1980. At the time there was an upsurge of popularity in shortwave listening amongst teenage Japanese, brought about partly by the availability of inexpensive, good quality portable receivers. It was hoped that a station specifically targeting their interest in Western Rock music would be able to find a niche. To achieve the goal, a company by the name of 'Marcom' was formed to provide the financial and technical backing required. The company president was a gentleman by the name of Lawrence S. Berger, at the time owner of KHVH talk / news radio in Honolulu, Hawaii. In a discussion I had with him early 1989, he informed me that the total expenditure required to make KYOI operational was approximately (US)$4,000,000. As president, Mr. Berger's personal financial commitment to Marcom was 50% of it's total worth, a very large gamble to make! He summarised what was discussed in a letter (Click on the link to see this document - 46k) he wrote to me on February 27, 1989. I am now sorry I didn't make notes about what was discussed. We covered a lot more ground, in the fifteen or so minutes of conversation, most of which has faded from memory now! A transmission site was selected - Agingan Point (Grid Coordinates: 145 41'E 15 07'N) on the island of Saipan, part of the North Marianas Islands. Guam and the North Marianas Islands are all part of the 'Commonwealth of Micronesia', a United States protectorate. The construction work on Saipan took approximately 8 months. It's remote location certainly added to the cost and logistics of making this all happen. 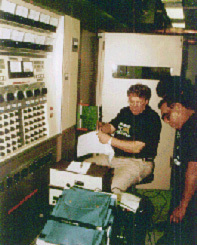 The building housed a Continental Electronics 418D-2 A.M. 100kW shortwave transmitter. The transmission antenna was a TCI 4 x 4 curtain antenna (Model TCI 611) - approximate gain of 16dB. 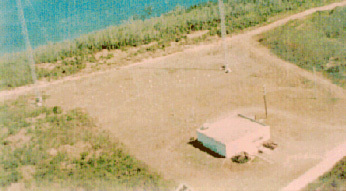 The position on Saipan allowed for a single hop propagation path to Japan, and with the available transmitter power and antenna gain, provided a very strong signal in the primary target area suitable for reception on inexpensive receivers. Included here is the only photograph I have been able to find of the transmitter site from this era. This was taken shortly after construction was completed. Subsequently 1600 to 2200 UTC consolidated on 9670kHz. This schedule remained unchanged for just over four years. The only interruption to the continuous flow of music occurred on the first Tuesday of the month from 0200 - 0600 UTC when the station would close for maintenance, if required. The programme consisted of continuous top 40 / rock music controlled primarily by a computer audio sequencing system, with automated song title and station ID announcements inserted as required. The programming was produced by Drake - Chenault in Canoga Park, California. I suspect this is how the slogan 'Now Music from L.A.' wound up being used on KYOI. Hank Landsburg from Drake-Chenault tells me that they did nothing special as far as the production values used in making tapes for KYOI. Marcom were merely another customer, who had chosen the 'no-announce' and mono programme options for their contract. Presumably Marcom was adding the English and Japanese voice announcements independently, probably using studio facilities provided by KHVH in Hawaii. The equipment used to present the programmes was industry standard 1/4" tape. There is a lot of detail on how the automation system worked on the Drake - Chenault website. I did notice a few times at which something would go wrong with the flow of music, but it is a tribute to how well the automation system was designed however, that such failures were rare. The most likely time that the sequencing would be noticeably wrong was immediately after KYOI returned to air after a maintenance break. I suspect that this 'mis-sequencing' were caused by the technicians at Saipan unceremoniously stopping the automation system mid-song, instead of closing it down properly and resetting the tape positions prior to restarting. The Drake - Chenault system was the state-of-the-art in taped music presentation in this era. The audio transitions from track to track were very smooth and well structured. On air, it sounded so natural that the audience were unaware of the fact that they were listening to a computer sequencing system. 'Seiko' had the distinction of being the first commercial advertiser on the station, sponsoring the automated time announcements at the top of each hour. 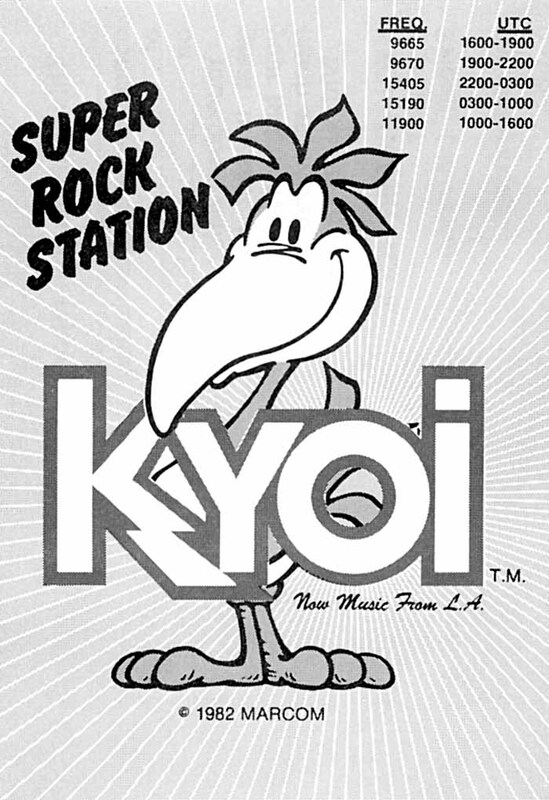 I first heard KYOI on Saturday, 5 February 1983. I was instantly taken! It was one of the few places on the shortwave dial where you could hear top 40 / rock music, and what was even better, with virtually no interruptions and 24 hours a day! Reception in Australia for most of the 24 hours was excellent, even on a modest portable receiver such as my Sony ICF2001 using the inbuilt whip antenna. The period from 1600 - 2200 UTC was the poorest, primarily because during this time, KYOI's signal on the 31m band suffered a lot of competition from other stations. My enthusiasm soon spread amongst my friends and KYOI picked up several more devotees in south-east Queensland. "Presented to Amita Corporation by the Sony Corporation." I remarked to the sales assistant that it was the first time I had seen any KYOI promotional material. She knew little about the station, and was under the mistaken belief that it was located on Guam. I corrected the error! I never did discover what the association between Sony, Amita and KYOI was, if any. Within months of it's debut KYOI was adding new features. 'Music World' (short music industry related news items, interspersed throughout the music), the 'Top 30 Countdown' (presented by KYOI announcers Doug Flodin and Mariochan) aired twice over the weekend, and 'New Rock Special' produced by KROQ in Los Angeles. These programmes had great listener appeal, and were the spots where the vast majority of advertising aired. These specialist programs certainly were not live. They were probably pre-produced and presented from reel-to-reel tape, I suspect from the KHVH studios in Hawaii. The ending of these programmes presented one of the rare opportunities were the station had to 'fill' to the top of hour, and the return of normal programming. A special 'station ID promo' track was created for this purpose. Doug Flodin passed away in mid 1985 and was replaced by Scott Kenyan as the English voice of KYOI. 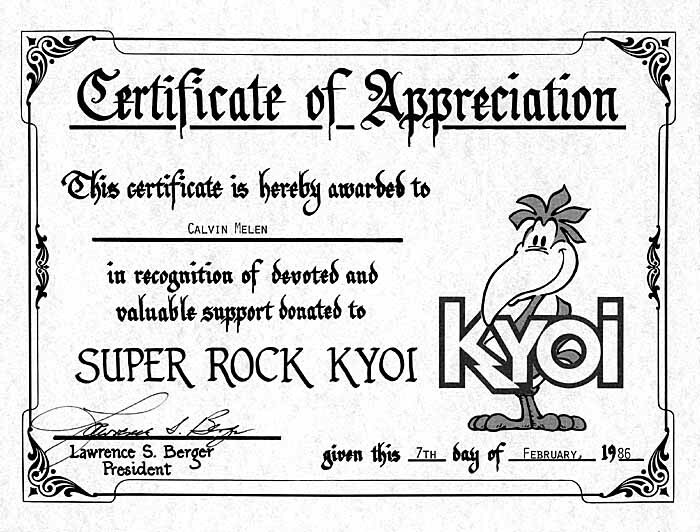 In April 1984 KYOI began running announcements asking for listeners to write to them. They specifically asked for listener's location and age. The address given was P.O. Box 1629, Canoga Park, C.A. 91304, U.S.A. I asked Lawrence Berger about this when we spoke in 1989. He was really at a loss to explain why this post office box was advertised, except that perhaps it was in keeping with the slogan: 'Now Music from L.A.' - it would appear that the mail was being diverted via the Drake - Chenault offices to Hawaii. In reality KYOI, through the entire period of ownership by Marcom, had it's headquarters at the KHVH offices at Palua Towers, 1001 Bishop Street, Honolulu, Hawaii. Later on (probably some time in mid 1985), the promo was changed to give the Hawaii address instead. To remain a viable entity KYOI had to sell advertising time. Unfortunately, Marcom got a very cold reception in the Japanese advertising community. They also had very little interest from the U.S. marketplace, which is heavily reliant upon audience demographics, something the station could never hope to provide in the required detail. Despite the disinterest, some advertising was secured. I remember advertisements for companies such as Coca-Cola (in Japanese) and AT&T. KYOI was in reality however, being primarily supported by it's initial backers, a situation which could never be sustained indefinitely. At the end of 1985, things took a turn for the worse when a major transmitter fault silenced the station for several weeks. It returned to air in the last week of 1985.
was threatening the survival of KYOI, and asked for donations to help cover the cost. On-air acknowledgment was promised, and apparently some were made, but I don't recall hearing any such messages myself. I donated, as did many others worldwide. I now have a 'Certificate of Appreciation' in recognition of support - something I will always treasure. Unfortunately, the flow of donations did not halt the slide towards financial collapse. 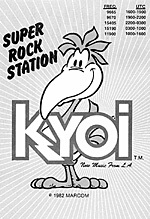 Towards the end of 1986 Marcom had no choice but to place KYOI on the market, hoping to find a buyer willing to continue their plans. 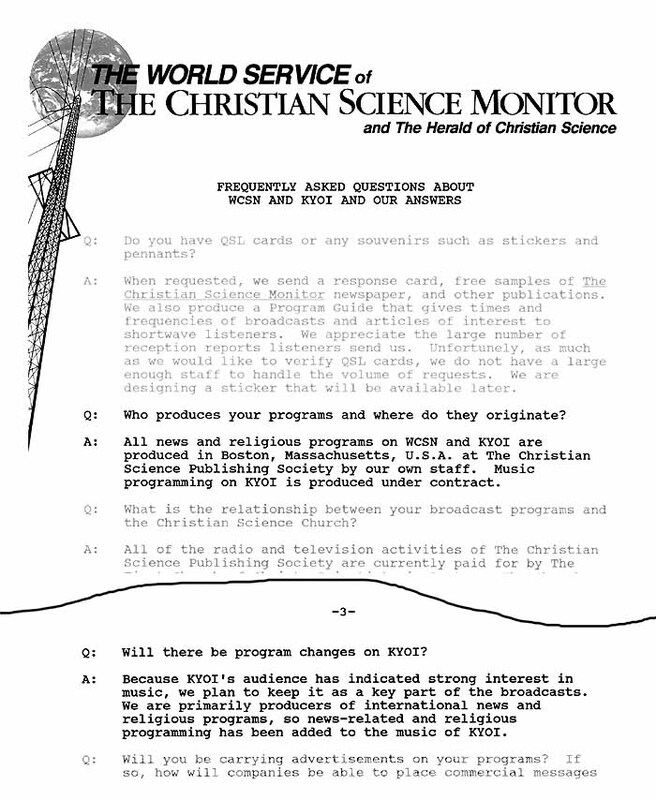 In December 1986 the Herald Broadcasting division of the Christian Science Monitor Syndicate Inc. purchased KYOI. 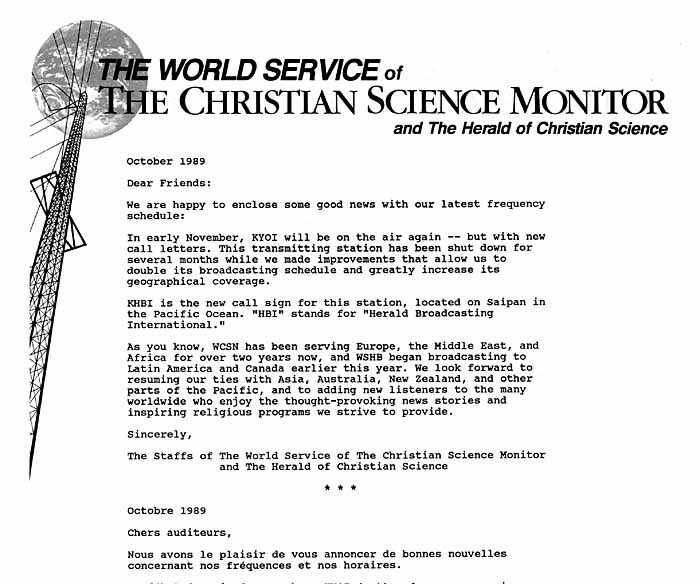 Their intention was to form a network providing the 'World Service of the Christian Science Monitor' using KYOI for coverage of Asia, WCSN (operational March 1987) for coverage of Europe from Scotts Corner, Maine U.S.A. and WSHB (operational March 1989) for coverage of Canada, Europe, Africa and the Pacific from Cyprus Creek, South Carolina, U.S.A. Initially the KYOI callsign was retained, and programming was unchanged. I suspect that Drake - Chenault was still providing the programme content after the change of ownership, but have never been able to confirm this. Herald Broadcasting hinted at this in a FAQ (Click on the link to see an excerpt from this document - 100k) sheet they published. By this stage the listeners of KYOI were aware that it had been starved of funds and was in serious need of help. Transmission quality had slipped badly, with loud hum being evident on the transmitter. Whilst I had the opportunity, I even asked (half tongue-in-cheek) if Herald Broadcasting would consider modifying the curtain antenna on Saipan, by removing the rear reflector screen to make the radiation pattern bi-directional. This idea would have dropped the forward gain by 3dB (barely perceptible in Japan), but would have raised the field strength in Australia by about 20dB. He liked the idea, but pointed out that it was not practical. Apparently he had actually visited the site, but did not say so in as many words. He gave me an undertaking to contact the technical support staff at Saipan, and also gave me the phone number and contact details for the transmitter site on Saipan, and suggested I make a follow-up call to discuss the problem with them directly. I phoned Saipan - The station manager, Mr. Dominador Villar, was most attentive and a delight to talk to. He was aware there was a problem, but not how serious it was. Apparently, the output from the transmitter audio monitor point, where they usually checked the performance, was marginal but still satisfactory. After my explanation of problems as perceived at the receive end, immediate steps were taken to diagnose the fault. Within 10 days repairs were completed and KYOI returned to sound quality we all expected. I included a photograph here of Mr. Villar and co-workers in the transmitter hall. "Q: Will there be program changes on KYOI? A: Because KYOI's audience has indicated strong interest in music, we plan to keep it a key part of the broadcasts. We are primarily producers of international news and religious programs, so news-related and religious programming has been added to the music of KYOI." Things did not go well for Herald Broadcasting either. 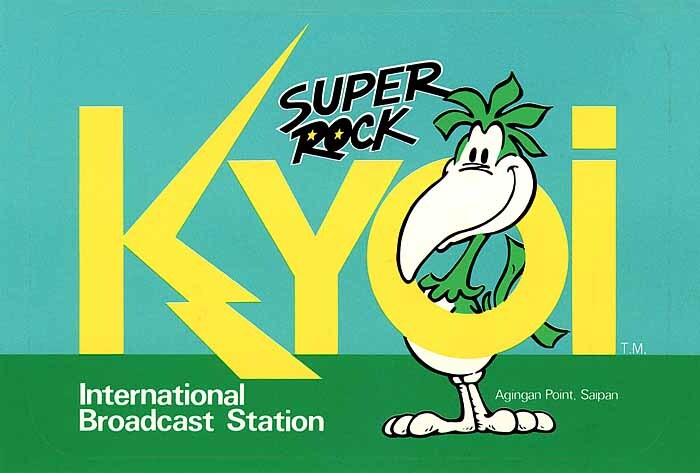 Their plans for a world broadcasting system, begun in mid 1985 with the initial licensing application for WCSN, the acquisition of KYOI in December 1986, and completed with the opening of WSHB in early 1989, began to fall apart. Financial pressure was again ultimately victorious. I believe the managers at Herald broadcasting were ill-prepared for the true costs of operating such major transmitting facilities. By February 1994 air-time was being sold to third parties at WCSN in an attempt to reduce operating costs. This measure proved inadequate to stem the financial losses, and shortly thereafter WCSN was sold. Prophecy Countdown, a Florida-based Seventh Day Adventist ministry, acquired the station and operated it under the title of 'High Adventure Ministries'. They changed the site callsign to WVHA and the licensed location to 'Greenbush' in Maine. (Obviously they did not physically move the facility, they merely changed the location as registered with the United States F.C.C.) It is reported that ultimately the running costs of this WVHA proved too great for Prophecy Countdown. When utility bills and loan repayments fell into arrears they were locked out of the station and the lender foreclosed. The station again appeared on 'for sale' lists. In 2002 it was purchased by LeSea Broadcasting and operated for several years under the callsign WHRA. In 2009 LeSea Broadcasting decided that WHRA had outlived it's usefulness and it was closed down and dismantled. The transmitter and some other elements of this station were relocated to WHRI in South Carolina. The former KYOI operation on Saipan suffered a similar fate. 1998 saw Herald Broadcasting place KHBI on the market. It sold quickly, and is now owned by the International Broadcasting Bureau (IBB), the U.S. Government body responsible for the operation of shortwave stations which provide U.S. government opinion to various world troublespots. The Saipan site has been expanded and the building now houses 3 x 100kW Continental 418 transmitters (a Continental 418F was added) and three TCI 611 curtain antennas. It has been operationally merged with a new transmitting station located on the nearby island of Tinian. This merged entity is known as the "Robert E. Kamosa Transmitting Station (REKTS)" - more information is available here. Programmes transmitted originate from the Voice of America, Radio Free Asia and the Australian Broadcasting Corporation (A.B.C.) Asia Pacific Service. Thus ended an era - a great pity in reality. With the advent of digital transmission using techniques like DRM, a station like KYOI with it's original format, would probably enjoy a whole new lease on life. Improvements in automation and transmitter reliability would also mean the station operation costs would be substantially lower than was the case 20 years ago. The much better audio quality and availability of low cost, simple to operate receivers would ensure a vastly expanded audience, and a much greater probability of financial success. I now listen to what few recordings of the era survive and reminisce about what might have been. I receive quite a bit of email from people across the Globe who have their own recollections of the KYOI era. You can read some of their thoughts here. KYOI site photographs: provided by George Jacobs and Associates Inc.
Special Thanks to Alex Zinoviev and Oleg A (from the former Soviet Union), Norbert Kreitel from Germany for additional information, audio clips, help and encouragement in maintaining this site. Norbert Kreitel has provided a copy of this site translated into German here. Click on the map above for a larger view - Courtesy of ClustrMaps. Observation: Our website hits seem to match KYOI's coverage area quite well ! Display of these pages optimised for Version 4.08 or later, on a 1024 x 768 pixel display with 64k colours or better. All promotional photographs and advertising material, corporate names and logos, product names, trade names, trademarks and registered trademarks are the property of their respective owners, and are acknowledged as such. Whilst every care is taken in the preparation of the information presented in these pages, I take no responsibility for errors or omissions. Copyright ©2002 - 2011 Calvin MELEN, Australia. Last updated on March 16, 2011.